This was by far our biggest money saving decision. When we started paying off debt, our credit card interest rate was right around 25%! Trust me, having an interest rate that high can make you feel like you will never dig yourself out of debt no matter how hard you try. Because we no longer wanted to see all of our money going toward interest, we decided to take out a loan to pay off our credit card debt! In doing this we were able to reduce our interest rate from 25% to around 12% and in turn it reduce our monthly bills as well. See if you qualify for lower interest rates with The Loan Exchange. It’s super quick and can end up saving you huge! I can’t believe it took me so long to jump on board with having a timer for our electronics at night. It wasn’t until I heard about how terrible it can be to have your wifi on all night that I finally purchased a timer. We use our timer on our router so that it is turned off from 10pm to 5am. Not only does this save us on electricity, but it also stops us from wasting precious sleeping time scrolling on our phones! Check out some of these great timers. Did you know you can have someone else analyze your spending and find where you are wasting money? It’s totally true. That’s how the Trim app works. Trim works with most major banks in order to help analyze your spending and find places where you can reduce your monthly bills. The best part is, they do all the work for you! I was super hesitant to try out the Trim app. Giving out my account information makes me really nervous, but because they were trusted by my bank (that I trust) I figured I’d give it a try. BAM! Instantly I was notified that I could reduce the cost of my internet each month! Trim also sends me updates and alerts when any of our accounts get low or if purchases and payments are made. If you need a little help dissecting your budget, give Trim a try and find out where you might be wasting money without even knowing it. Hey, be honest with yourself, if you’re not a gym goer just go ahead and let that membership drop. Many people enter into gym contracts with the best of intentions but just can’t seem to stay consistent. If that sounds like you and you are financially struggling, it might be a good idea to consider dropping that membership. If you still want to get training, consider something like the Aaptiv app that allows you to workout from anywhere and get one on one personal training right from your headphones. You can get 30 days totally free and after that you can get training from around $15 per month! Considering that most gym memberships are on average $69 per month, changing the way you workout might be a great way to reduce your monthly bills. Maybe you’re like me and even though the idea of saving big time by quitting the gym, you just can’t seem to give up the benefits. I have been a big gym goer ever since my husband and I started dating and now that we have a house full of kids (and I homeschool them) I just have to take full advantage of our 2 hours of childcare! Mama needs time to herself and my kids get to interact with children of all ages. If I am going to pay the higher cost of having a gym membership, you’d better believe I’m going to get my money’s worth. Not only do we take full advantage of the hot tub, sauna, and childcare, but we shower at the gym a much as possible. Taking the time to shower at the gym has the potential to greatly reduce the cost of your monthly water bill! We took out a loan to help reduce the cost of interest on our debt, but another option you may not know about is disputing your debt all together! You can get a free savings estimate to see how much money you may be able to potentially save with debt relief options that may be available to you. 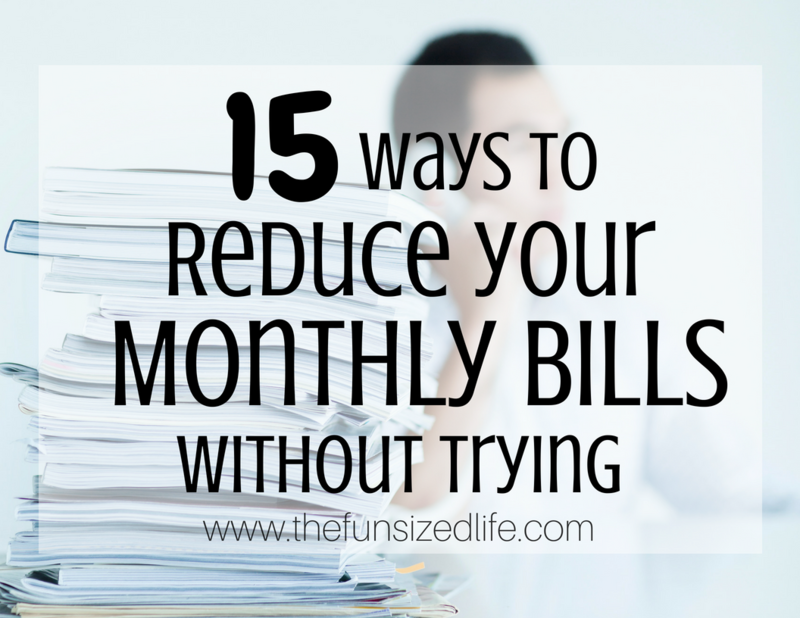 Not only might this reduce your monthly bills, but you have the potential to save yourself years of paying off unnecessary debt. Personally, I am trying to be a bigger advocate for our environment. That includes a desire to use cleaner, renewable energy sources. This isn’t always as easy as it sounds and can wind up costing a lot of money to get started. If you feel like I do about these environmental issues but can’t flip the bill for solar powered energy or a renewable power plan, try signing up for OhmConnect. Their service is totally free and you can cancel anytime. OhmConnect will let you know when your energy is the cleanest and will encourage you to “turn off” when it’s dirty. In some states, you may even be eligible for cash back rewards when you turn off! To date over $4 million has been paid to OhmConnect users. See if you qualify. Lately, I feel like I should just pull up a chair and live at the pharmacy! While I don’t have any big prescription saving ideas (at least not yet) there is a way to save you some time and gas money by getting them delivered right to your door free of charge! PhilRX will work directly with your doctor and current pharmacy in order to ensure that your refills are always ready to go. You can manage everything right from the app and PhilRX will even deal with insurance issues for you as well. See more about how it works. Many major grocery and store chains are also hopping on board with their own pickup or delivery services! I strongly recommend checking your local grocery chains to see if they allow you to purchase online for either delivery or store pick up! While there may be a service fee for some of these services, chances are you will still end up reducing your monthly bills big time by not pacing the isles at the grocery store! It’s happened to all of us, we go in only needing $20 worth of stuff and somehow we leave with $75. Ordering online allows you to resist temptation, stick to a budget, and save yourself the time and stress of rushing through the grocery store. Because gas decreases in price after the weekends, rumor has it that gas is most likely at it’s cheapest on Tuesdays! Maybe this is why a lot of gas stations also offer things like “double coupons” on Tuesdays? Always keep an eye out for coupons in your local newspaper and get yourself familiar with in house discounts or competitor price matching guidelines. If you are a homeowner and have more than 20% equity built up in your home you should no longer be paying private mortgage insurance costs! This is something to look into with your insurance provider. Canceling private mortgage insurance could greatly reduce your monthly bills and also end up saving you thousands each year! I have heard before that keeping your thermostat at a steady 69-degree year round is the best way to save money. However, that argument is still up for debate. If you work away from home during the day, it would be a good idea to get your thermostat programmed to drop 7 degrees or so in temperature while you are away and increase the temperature an hour or so before you are to arrive back home. You can also set another timer to reduce temps by 4 degrees while you sleep. This way you aren’t paying to heat your home at times when it is less necessary. Maybe not for a shower, let’s not go totally crazy. But, you can give your water heater (and the cost of it) a break by choosing to wash your clothes in cold water. This method is not only a good way to reduce your monthly bills, but it can also help prolong the life of your clothing and prevent shrinking! More money each month, less unnecessary shopping all year! There are some things in life that give you the option to pay annually for a larger up-front fee or make smaller monthly payments. Making small monthly payments can be tempting, but you will usually save big time by paying the cost up front. For example, you may be able to pay $120 per year ($10 per month) up front or make monthly payments of $14 ($168 per year.) That smaller payment may seem better up front but will cost you each month and wind up costing you more money altogether. Be smart about programs and services that allow you to pay one large fee up front because chances are it’s a better saving in the long run. The idea of cutting cable is definitely not a new thing by any means. Programs like Netflix and Hulu are taking over the world and less and fewer people are sticking with their cable packages. But what about those people who really love watching football or the local news at night? If you have been clinging to your cable bill just for the sake of hanging onto a few channels, it might be time to invest in a digital antenna. You will still be able to get your basic channels throughout your home while potentially reducing your monthly bills and saving yourself around $1,000 per year. There is an awesome company called Ting that charges way less for phone usage than you typical phone company. We currently have 3 lines and pay over $170 per month!!! With Ting those costs get reduced to $55!